This car can drive itself from A to B. It's taking part in the Darpa Grand Challenge, a Pentagon contest for inventors to come up with self-driving vehicles - and the ideas are already starting to be used in today's cars. On a quiet university campus across the water from San Francisco, an enthusiastic bunch of young computer boffins are working on what could be the car of the future. "Sometimes we talk to it as if it's an unruly child," says co-team leader Ben Upcroft. Another member of the team jumps out of the front seat, crosses the road and presses a red button on a box in his hand. "The RAV4 is going autonomous," he says into a radio. The car moves, slowly forward, like a learner terrified of touching the accelerator. The steering wheel is turning. It is driving itself. The speed is frustratingly slow, and from time to time the car veers towards the verge. But what's impressive is that no-one is sitting inside. 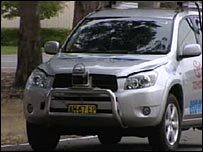 The Sydney-Berkeley driving team are entrants in the 2007 Darpa Challenge, to be held in October. Sponsored by the United States Government, which wants to develop driverless military supply vehicles for war zones, the challenge will end with a 60-mile race through a mocked-up "urban area". The most important rule? No humans allowed. The location of the challenge hasn't yet been announced. But it's likely to be a US military base, with roads and intersections. More than 50 teams are in the running, with 30 expected to start the race. Cars will have to navigate by themselves, avoid other cars, circumvent traffic jams, stop at junctions, follow road markings and give way when they're supposed to. A serious test for artificial intelligence. There is a clear favourite. Across town from Berkeley, the team at Stanford University are entering Junior. Again an ordinary-looking estate car - apart from £250,000 worth of sensors mounted on its roof. These can scan forwards, sideways and backwards to find the edge of the road and any moving objects in the car's way. Junior is still being tested off-road, but it is easily capable of driving itself at speeds that would be quite acceptable in the average city. The team are training it to cope with busy intersections, a vital skill for city driving. We watch as it approaches a crossroads marked with cones. Another car arrives from the left. Junior stops, thinks for a minute, lets the other car turn right, and then makes a graceful left itself. Both the Sydney-Berkeley team and the Stanford team are finding the challenge isn't so much building a car that can keep itself on the road - they've cracked that. 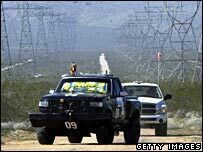 The last Darpa race was in the Nevada desert. Some cars ended up in the bushes, but four managed to complete a 160-mile course. Stanford's team got there first. They're also close to cracking the problem of detecting other traffic, and pedestrians. 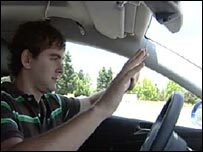 Mike Montemerlo from the Stanford team believes the winning car will be the one that quickly gets itself out of jams, a considerable task for a computer, and made more difficult by the fact that much of the rest of the traffic will also be computer-guided. The main challenge is trying to teach the cars not to be too cautious. The Berkeley car can be thrown into a panic by a falling leaf. "The computer sees the leaf as though it was an infinitely high concrete pillar sticking out of the ground," says one technician. That means the computer tends to hit the brakes a little too often. The Berkeley team admit they're outsiders, but believe training their car on a real road may help them with the unforeseen problems likely to be thrown up by the race. But watching the teams put their vehicles through their paces, it's clear that the safety of computer-controlled vehicles is becoming less of a worry. So how long it will be before computers can drive as safely as humans? "How have you convinced yourself that human driving is safe?" says Stanford artificial intelligence expert Professor Sebastian Thrun. "We kill about a million people a year around the globe. Almost every loss of life is a result of human error. Statistics will tell us the truth, that these cars are more reliable than human driving." Apart from the US Government's aim of making the resupply of military units a safer prospect, this research is one day likely to be used to build future cars. There are already models that can park themselves, or keep in their lane on a motorway. Professor Thrun has more extravagant ideas. "You might buy a car that has a special button called an 'auto-chauffeur' button. You push it and it drives you home and wakes you up in your garage. And maybe we have the self-park button that says 'drop me off at the office then go and find yourself a parking spot'. You could have a mobile phone button that calls the car back when you need it." A future where your car is an obedient pet sounds fantastic. Unless you're the law firm of a motor manufacturer. Imagine if the auto-driver fails, and there's injury or death. Instead of the driver getting sued, the car company is in the dock. So much of this technology will be introduced gradually. But there are other less obvious benefits. Children could be driven to school. The elderly and visually impaired could gain new mobility. 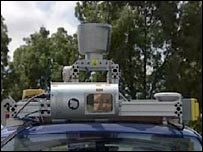 Computer-controlled cars could organise themselves more efficiently, talking to each other to minimise the space they take up on the road without getting too close. That could cut traffic jams - and road rage. And you could read the paper, or answer e-mails on the way to work instead of sitting, hands locked to the steering wheel, seething with frustration. In the future, we could all be back-seat drivers.